Who said women cannot weight train, or that women cannot lift weight to get a toned and well defined body. Here are some tips for women to weight train. Decide what you want to get out of your workout. Are you after Jennifer Aniston’s arms or a job with World Wrestling Entertainment? Are you lifting weights to improve function, health, appearance, or sports performance? Once this has been determined, you can better tailor your routine, choosing exercises that will target the proper muscles. “Exercise is like medicine, it’s based on science.” If you have no experience with weights, experts recommend seeking guidance from a trainer. One thing to keep in mind is to avoid hyper-extending or locking out any joints. This allows the muscle to relax, which is counterproductive. Also, be sure that your whole body is properly aligned in order to protect the lower back. “Don’t fall in love with any one exercise,”. If you repeat the same exercise, you will overdo a particular muscle group. Everyone undoubtedly has a particular asset they may want to develop, but don’t overdo it. Use a full variety of exercises, machines and resistances. Try lifting free weights, water, household items, and even your own body weight. Changing it up will shock the muscles, challenging them to lift the weight. Don’t cheat by racing through your exercises. Remember, it only takes one set so be sure to get the most out of your time in the gym. Take one to two seconds to contract the muscle, hold the contraction for half a second, and then lengthen the release to three or four seconds. You are 20 percent to 40 percent stronger on the way down so following this time breakdown will maximize strength gain. People generally work out only what they can see, it’s as if they have a ‘Cadillac in the front, and a Volkswagen in the back. '” But too much time devoted to one side may create posture problems. Since, every muscle has an opposing muscle, be sure to work the entire pair. For example, follow stomach crunches with back extensions and bicep curls with tricep kickbacks. 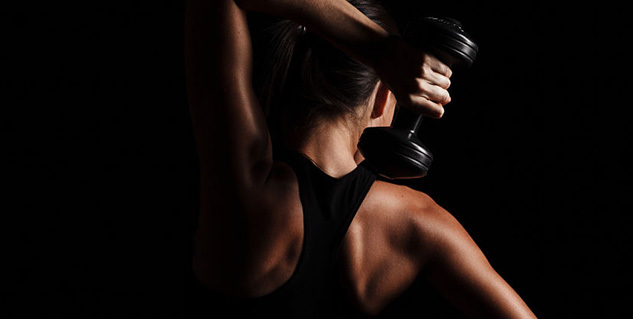 Women should pay particular attention to building strength in the upper back and shoulders. This will protect against poor posture later in life, a common problem related to osteoporosis. And don’t neglect your lower body — females are five to six times more likely to suffer a knee ligament tear. To protect against knee injury, focus on building the hamstring muscles. A lifting partner is helpful not only for spotting but for motivation as well. When your arms are feeling like Jelly and you think you’ve got nothing left to give, a little encouragement from a friend may be all you need to push out that final rep. Although optional, a little caffeine may give you an extra boost of energy to lift after a long day. You may be surprised by the effects a cup of coffee or can of soda can have on your performance. “Rome wasn’t built in a day; you won’t be either,” It takes time to incorporate the benefits of weight lifting. Changes in muscle fibre won’t show until four to six weeks, but in the meantime, your muscles are learning how to act more efficiently. Patience is the key to ideal weight management.